Wong Fleming is a member of IR Global, the leading and largest international professional services network. This global community is leading a new 'professional services model' to adapt to the growing requirements clients desire from lawyers, accountants, and business advisors. Members of IR Global actively participate in networking events and work alongside others from around the world to contribute to a sharing economy that is ethical, sustainable, and provides significant added value to the client. 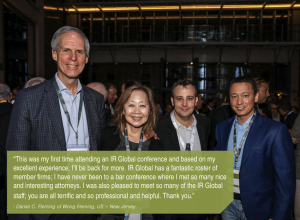 Partners Linda Wong and Daniel Fleming attended the IR Global Annual Conference in London- Partners Linda Wong and Daniel Fleming attended the IR Global Annual Conference in London at Grange St. Paul’s Hotel from October 13-16, 2018. A full overview of the event is summarized in the post-conference event pack.